Many of the 2012-2013 notebooks like ASUS UX31A, ASUS UX32VD, Dell XPS 13 or HP Elitebook 9470m have been shipped with Intel 6235 ANHMW. It is a 802.11a/b/g/n half-size minipci wireless card with IPEX MHF4 antenna connectors. Unfortunately, the industry has switched to U.FL connectors. I have experienced a rising number of issues with the Intel 6235 in the 2.4Ghz band. So I have started to look for alternatives – without success. The popular 802.11ac half-size minipci cards like Intel 7260 or Broadcom BCM4352 were not an upgrade option (all U.FL). 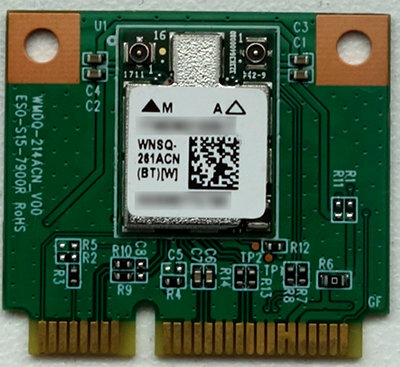 In May 2017, SparkLAN hast released a 802.11ac half-size minipci card with IPEX MHF4 antenna connectors – the WPEQ-261ACN(BT). The card is based on the Qualcomm Atheros QCA6174A-5 chipset with MU-MIMO support and integrated Bluetooth 4.1 support. I could not resist to order a sample and tested it with a ASUS UX31A ultrabook with an TP-Link Archer C2600 router (QCA9980 4×4 with MU-MIMO). The card has been recognized by the ath10k driver on my Ubuntu 17.04 and operates very stable. With full signal strength I have been able to reach more than 50 MB/s transfer speeds in the 5GHz band. Bluetooth operates stable with a Microsoft Bluetooth Mobile Mouse 3600 (BT 4.0). The card is now available in the U.S.